UNLV shortstop Bryson Stott, who also went to Desert Oasis High School, made the 26-man USA Baseball Collegiate National team for an international series. Team USA will play Japan in various U.S. cities from Tueday to Sunday and at Cuba on July 10-14. 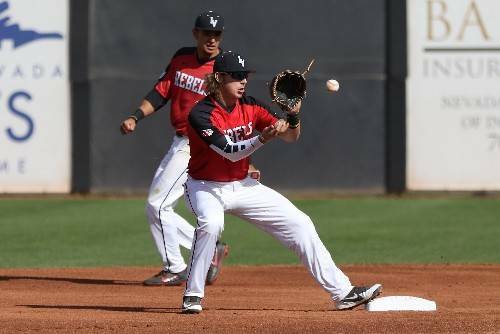 UNLV shortstop Bryson Stott covers second base against Fresno State on March 3 at Wilson Stadium. Photo of courtesy of UNLV Athletics. UNLV shortstop Bryson Stott, who also went to Desert Oasis High School, made the 26-man USA Baseball Collegiate National team for an international series. Team USA will play Japan in various U.S. cities from Tuesday to Sunday and at Cuba on July 10-14. As a freshman at UNLV this past season, Stott hit .365 with 32 RBIs and 30 doubles.